The Search for the next Mr. World Philippines is now officially on! The national franchise of the Miss World pageant in the Philippines headed by Mr. Arnold Vegafria announced that the search is on for Mr. World Philippines 2018. The winner of the male competition will represent the Philippines at the prestigious Mr. World 2018 competition in September. The winner will follow the footsteps of Sam Ajdani, John Spainhour and Andrew Wolfe in representing the Philippines. Aside from Mr. World Philippines title, Mr. Eco International Philippines title is also at stake. 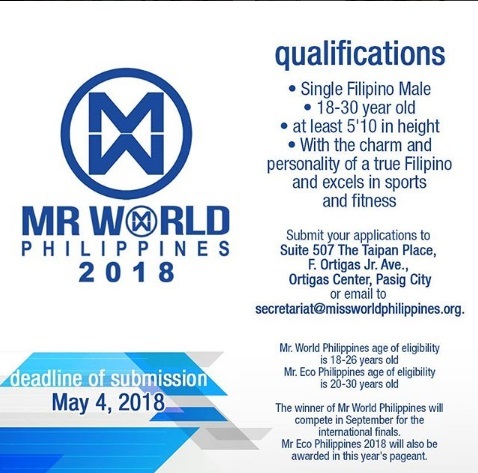 Submit your applications to Suite 5017 The Taipan Place, F. Ortigas Jr. Ave., Ortigas Center, Pasig City or email secretariat@missworldphilippines.org. Deadline of submission is on May 4, 2018.